Nature is like an artist working on landscapes; using small brush strokes on a canvas, taking millions of years to paint, and yet the masterpiece is never completed. In the case of the Meteora monasteries, it seems that the painter went a bit more abstract than usual by abandoning the typically mild, harmonious lines and replacing them with powerful vertical strokes. Breaking the usual form and creating something that looks more alien than earthly. The outcome is a place scattered with monumental boulders – many of them column-shaped and rising vertically to the sky, consisting of sandstone and conglomerate that once was part of a delta seabed. To make things look even more extreme, a handful of monks climbed several of these columns at the beginning of the 14th century and built more than 20 monasteries at the top of their jagged peaks. Some of the Meteora monasteries are so tightly built on these pillar tops, that it seems as though they’re integrated into the rock. Meteora is one of the best places to visit in Greece. Make sure it’s firmly placed on your travel itinerary. The first hermits arrived in Meteora at the end of the 10th century and created the first sketes (small monastic communities). These people wanted to live in complete isolation and the inaccessibility of the area provided just that. They lived and slept in caverns and rock fissures and their only occupation was praying for the salvation of themselves and the world. The only time the hermits left their sketes was once a week. Every Sunday, they’d hike to the small temple they had built on the south side of Doupiani rock to have a mass together and speak about the problems of the community. That was also the only time in the week that they had a properly cooked meal. This routine went on for more than 3 centuries until a monk named Athanasios built the first monastery on top of a boulder called the “Broad Rock” and named it Great Meteoro. More Meteora monasteries were built after that and eventually they reached a total of 24 when monasticism (monkhood) in Meteora was at its peak during the 16th century. The logistics needed for all of this construction was a nightmare, but if the monks had something in abundance, it was time. Carrying materials and building up on the rocky pillars was treacherous business but they managed to overcome many difficulties by wedging beams on the rock walls and constructing scaffolds. Much later, they replaced the scaffolding with nets and baskets that they pulled to the top with a rope. A much better solution, but still not entirely safe. At the beginning of the 20th century, many monasteries here had stairs carved in the rock which made the access much easier. It was this that opened Meteora monasteries to the outside world and allowed the first visitors to arrive. Among them the famous Swiss traveller and photographer Frederic Boissonnas who visited Meteora in 1930 and made its existence known to the rest of the world with his iconic shots. Later in 1981, James Bond movie “For Your Eyes Only” with Roger Moore would feature Holy Trinity monastery as a shooting location and bring Meteora into the spotlight with some impressive action scenes. ☞ Planning to travel to other areas of Greece? Make sure to check out our articles for some travel inspiration: Things To Do in Ios, Best Beaches in Greece, Things To Do in Corfu, a Travel Guide to Lesvos Greece, a Travel Guide to Chios Greece, a Travel Guide to Kefalonia Greece, Weather in Greece (when is the best time to visit?) 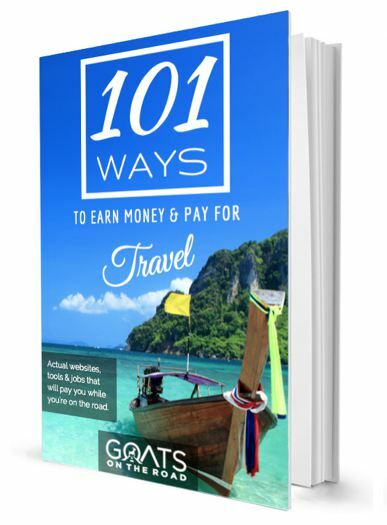 and Things To Do in Zakynthos. 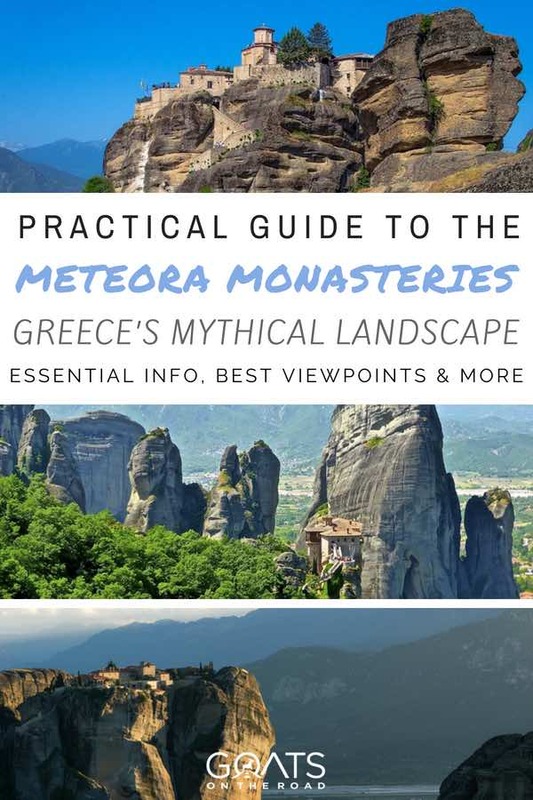 People from all over the world gather in this relatively small area of Thessaly plain to visit Meteora monasteries and admire the breathtaking landscapes around them. Meteora is one of the most visited places in Greece but fortunately, it’s remained relatively untouched by the tourism growth. 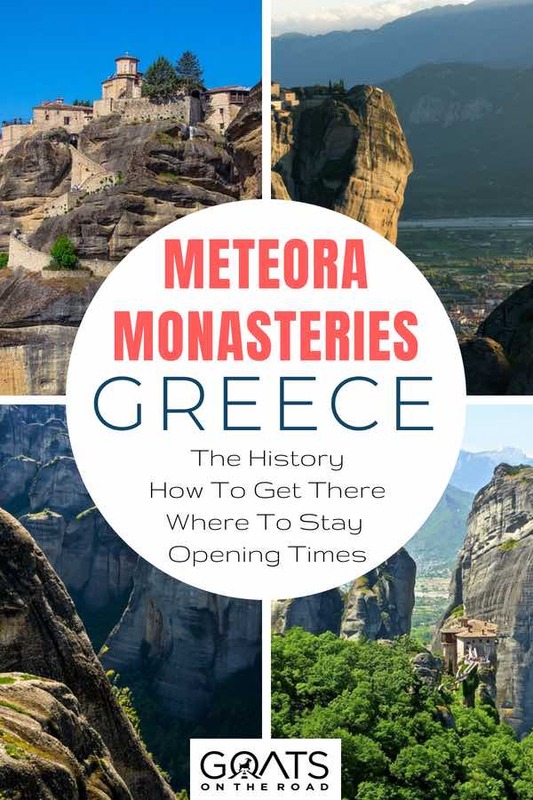 On the other hand, the nearby towns of Kalambaka and Kastraki village have grown significantly in the last century since they serve as a base for the majority of visitors to the Meteora monasteries. 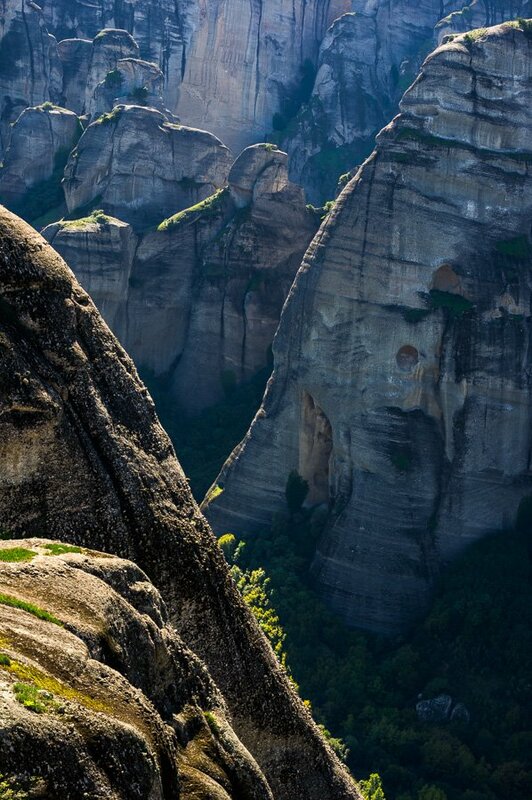 Meteora is also a famous rock climbing site in Greece and one of the most recognized in Europe. Climbing any of the 6 monastery boulders is not allowed but there are a hundred more in the vicinity. The local climbers offer tours suitable for everyone, from first timers to experts. Another activity that thrives here is photography. Needless to say that the terrain offers endless angles on the striking landscapes. With monasteries teetering at the top of massive limestone rocks, your images are sure to be impressive. Phones can do a pretty good job of taking photos nowadays, but a proper camera on a tripod can really shine out there – or better yet, a drone. During my last visit, I shot some of my most popular photographs (you can have a look here). My only advice is that you should wait for the sunset when the last light hits the monasteries giving the rocks a golden glow and helping their texture to be highlighted. The same goes the for sunrise if you don’t mind the early wake up. The snow in winter and early morning mists can make the same shot look entirely different. Because of this, most photographers go back again and again to shoot the Meteora monasteries throughout the year. At the peak of the 16th century, there were 24 monasteries, today only six monasteries are open, while the rest are in ruins. Each of these monasteries has a €3 ($3.50) entrance fee. Kids under 12 are free. Opening times can change so always check before visiting. The monastery that gave its name to the whole area is also known as the Holy Monastery of the Transfiguration of Christ. It is the biggest and the most important in Meteora. Its construction in the 14th century is considered a turning point and initiated a new era for monasticism in the area. It sits on top of a huge rock called “Platis lithos” which means broad rock in Greek. Its library is one of the greatest of its kind and has the most extensive collection of codices and old books in Meteora. It also has a great museum dedicated to the modern history and struggles of Greece from the revolution of 1821 against the Ottoman Empire until WWII. The original fully equipped kitchen and the cellar with the 12.000 litre wine barrel are of great interest. Summer (April 1 – October 31): 9:00 to 17:00. The monastery is closed on Tuesdays. Winter (November 1 – March 31): 9:00 to 15:00. The monastery is closed on Tuesdays and Wednesdays. This monastery has taken its name from hermit Varlaam who climbed its mighty pillar back in 1350. There he built a small cell to sleep along with three chapels. After his death, the place remained deserted for almost two hundred years until two brothers from the city of Ioannina renovated the chapels and started building the monastery back 1518. The access to the top was notoriously difficult as the wooden ladders that led there were quite dangerous. Later on they were replaced by a net which was pulled to the top with a rope. Eventually stairs were carved in the rock which allowed easy and safe access. Don’t miss the 16th century oak barrel which was used for water storage and the museum with religious paintings. Summer (April 1 – October 31): 9:00 to 16:00. The monastery is closed on Fridays. Winter (November 1 – March 31): 9:00 to 15:00. The monastery is closed on Thursdays and Fridays. This convent offers incredible views of the city, the valley of Thessaly and the Pindos mountain range. Summer (April 1 – October 31): 9:00 – 13:30 and 15:30 – 17:30. Closed on Mondays. Winter (November 1 – March 31): 9:30 – 13:00 and 15:00 – 17:00. Closed on Mondays. 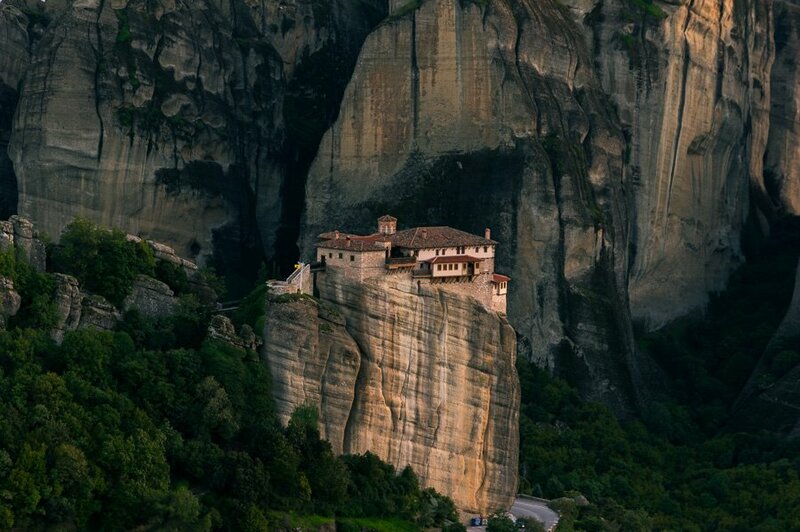 From the easiest Meteora monastery to reach to the most difficult. 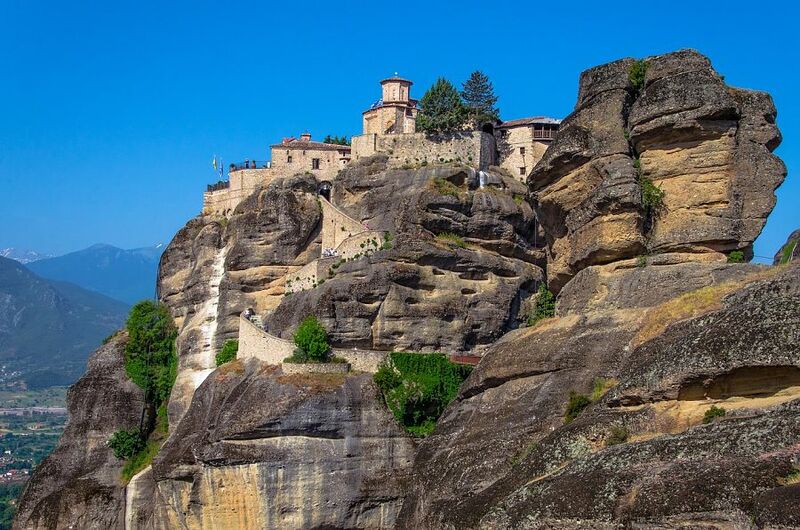 The Holy Trinity Monastery sits on a very steep boulder and has the most difficult access, but if you make the effort to reach the top, you’ll be rewarded with amazing panoramic views. You’ll get some incredible photos here. Visitors must climb 140 steps in order to get to its door at the top. No wonder it took monks almost 70 years to complete its construction. This multilevel monastery is the first one you will encounter after Kastraki on the way to Meterora. It’s very small and doesn’t have a yard but what it has is the most amazing frescoes of all the monasteries in Meteora. They were painted by the hand of the Cretan artist Theophanes Bathas Strelitzas who was a prominent painter of the Cretan school to which Domenikos Theotokopoulos (known as El Greko) also belonged. The second monastery you will encounter coming from Kastraki sits on the most impressive pillar of all. Surrounded by many other boulders of this “stone forest”, it’s the centerpiece of this dreamy landscape. Although at a fairly low elevation, it was still difficult for Monks to make the trek to the top. Eventually, a net was installed which still took 30 minutes to get them up there. It is one of the most beautiful monasteries to shoot during sunset. There’s also a pathway leading from the monastery, check it out! Saint Antonios, Saint Nikolaos Pantovas and Ipapanti are three impressive monasteries hidden inside huge rock cavities. They don’t have monks anymore and are more difficult to access but if you want to see something exceptional even by Meteora standards, they are amazing. There are also a number of sketes which you can see here and they’re in cavities on the rock faces. These are easily recognizable from the narrow wooden balconies and ladders that are perched there. There are trains and buses leaving from Athens and Thessaloniki for Kalambaka on a daily basis, or if you’d rather join a tour and have it all easily planned out for you, check out the various tours on offer below. There is a train (884) every morning going direct to Kalambaka at 8:20 in the morning. It costs 18.50€ and it takes around 5 hours. There are many other choices with a middle stop throughout the day but cost a bit more. Five buses leave every day from Athens to Kalambaka and the fare costs 31.50€. The duration is also 5 hours. Multiple choices every day, all with a middle stop. It can take from 2.5 to 3 hours and the fare is between 15€ and 25€. There are four buses a day going to Kalambaka. It takes around 3.5 hours and the ticket costs 22€. 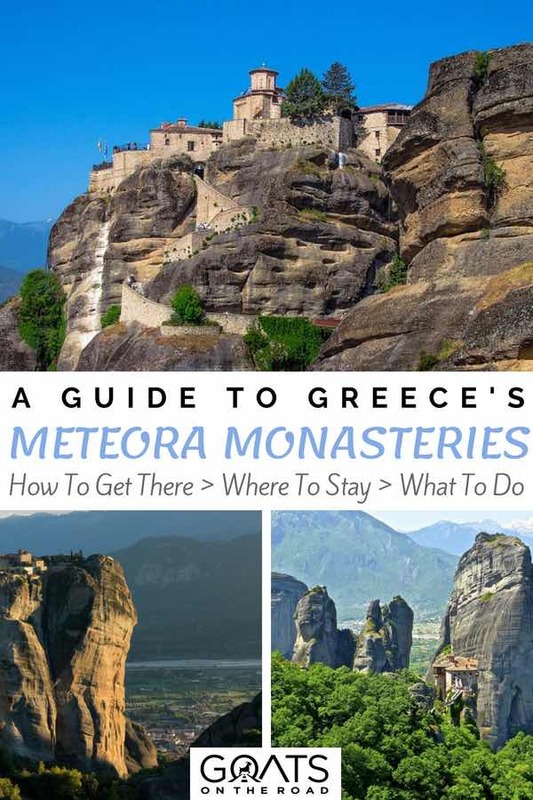 Basically, there are two choices near Meteora: Kalambaka and Kastraki. This small town has a variety of accommodations for every budget starting from 35€ and going all the way to 100€. The fact that it has a train and a bus station makes it very convenient. There are lots of restaurants and cafes plus it has a very nice natural history and mushroom museum if you have the time. Meteora is around ten minutes from the city center either by taxi or public bus. This scenic village is located on the foot of two monumental rocks. It has an ideal location if you want to hike Meteora since most of the trails start just outside the village. 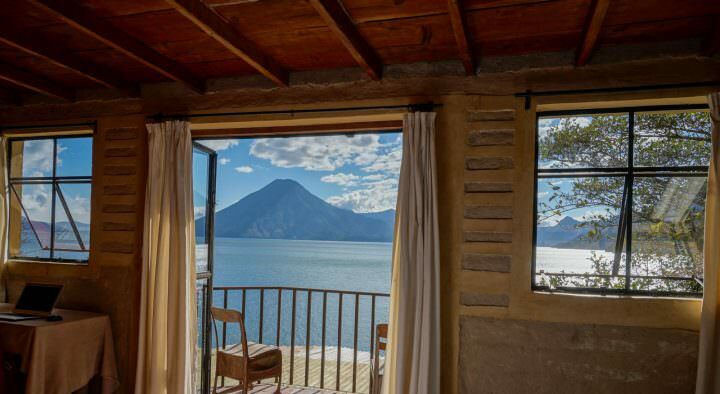 The place has adapted to the great number of visitors (2 million per year) and has several options for sleeping and restaurants to choose from. The cost for a twin room fluctuates between 40€ and 100€. Last time, I stayed in Pyrgos Adrachti – a small hotel next to Adrachti boulder with a breathtaking view from the north side. As for food, you can’t go wrong with most of the local taverns. The cuisine is amazing and the ingredients are as fresh as in the rest of Greece. Prices are fair considering the proximity to such a hot touristic site. Let me say in advance that you can’t visit all monasteries in a single day. If you really want to explore Meteora, you have to spend at least two days there. Other than hiking solo or in groups organized by the local guides, you can tour around the monasteries in a rental car, a taxi, or the public bus that starts every two hours from Kalambaka. If you are driving yourself, just find Meteoron street and it will take you to Kastraki and then to Meteora. 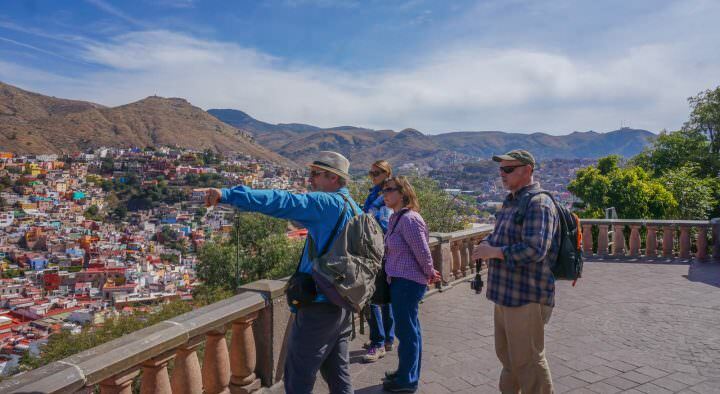 Except for the classic monastery tours, there are some guides providing sunset tours to great viewpoints as well as more extreme hiking and rock climbing tours with a via cordata (rope that you are attached to with a harness). When you are visiting the Meteora monasteries bear in mind that there are rules about clothing, mostly for women who have to wear long skirts in order to get in. In any case, there are special clothes at the gates that they give you to put on top of your current clothing, in case your skirt or dress is on the “short” side. Inside, you’re only allowed to visit certain sections of the monasteries and the monks are isolated in quarters where entrance is not allowed. 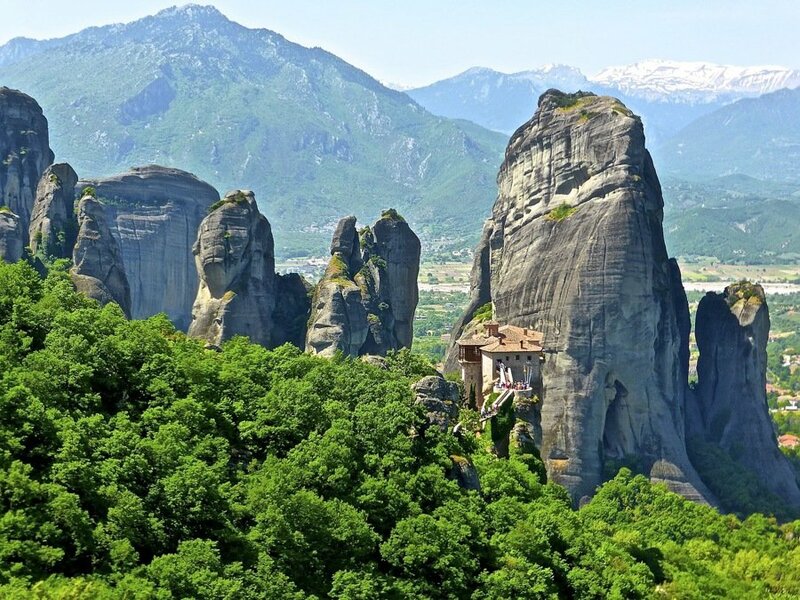 Meteora monasteries are living relics that have remained untouched by time for more than 500 years. Unlike museums and other historical sites, in Meteora you have the opportunity to fully immerse yourself in the history of a place that has managed to keep modern life outside its boundaries. 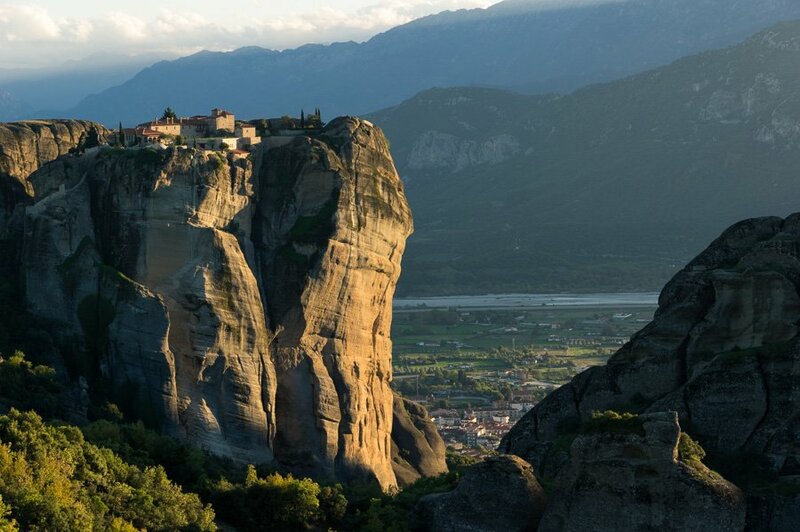 Meteora has protected the monastic way of life that these people have chosen to follow for more than a thousand years. Inside the Great Meteoron Monastery is a bone chamber filled with the skulls of all monks that lived and died there. When you see them, you realize how these people were (and still are) an inseparable piece of this stone forest, a place that provided them security and allowed them to live their silent lives having found God in this desolate, beautiful place. Chris is a photographer and blogger specializing in active/adventure traveling in urban environments as much as in the outdoors. Except from creating content for his blog Trip & Trail, he occasionally freelances for other media. 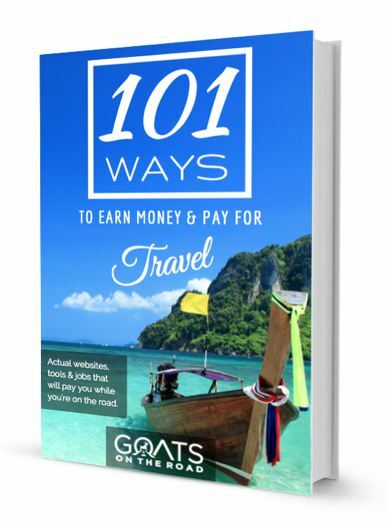 His mission is to introduce people to traveling as a means of education and character building process which will enrich their lives, open their minds and help them shift their point of view in this modern world where stress and materialism seems to be taking over people’s lives. Meteora is such a fantastic place! I loved your post! Thanks for sharing! What a great and comprehensive article! My fiance and I visited Meteora last July and it was one of the most incredible places I’ve ever seen!! I loved the juxtaposition of man-made architectural wonders versus spectacular nature! We stayed in Kalambaka and loved the close proximity to all the hiking and Monasteries! I’m glad to hear that you enjoyed Meteora. It’s a place we’re dying to visit!